Get a Taste. You’ll like what you see. Lana’s being paid to hunt Frankenstein’s monster. Actually, it’s not Frankenstein’s monster. It’s a rogue AI in a weird cyborg body and it’s killed its creator and a bunch of other people. The creator’s widow wants Lana to stop it at any cost. 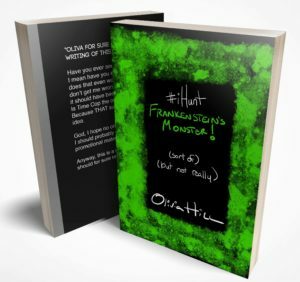 Mostly, #iHunt Frankenstein’s Monster is a story about cocaine. And dead people. And how people on cocaine like to obsess over dead people. And about how cocaine can make you just a little stronger and more alert, which is perfect for hunting monsters. So that’s it. It’s a story about Frankenstein, except not really, and cocaine. That sums it up. It’s really more about the sum of its parts. Which is funny, because, you know, Frankenstein’s monster. 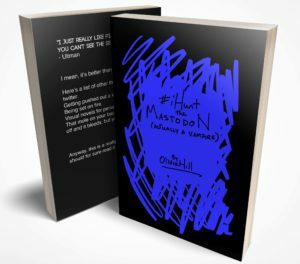 In #iHunt: The Mastodon (Actually a Vampire,) professional vampire hunter Alicia goes over her methodology for killing vampires and racking up social media followers while doing it. It’s a short story about social media, killing monsters, and how everything has to be monetized and commodified in the life of a millennial.